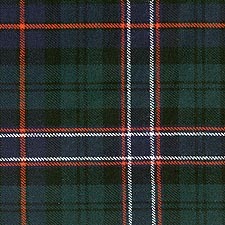 Scottish National Tartan is not produced in ribbon but is virtually identical to both the MacKenzie Tartan Ribbon and Rose (Hunting) Tartan Ribbon. Please note that these alternatives are so close to the Scottish National Tartan that there are no plans to produce Scottish National Tartan Ribbon in the foreseeable future... the resulting ribbons would look identical. Both MacKenzie Tartan Ribbon and Rose (Hunting) Tartan Ribbon are available to buy in 7mm (1/4"), 10mm (3/8"), 16mm (5/8"), 25mm (1"), 38mm (1½") and 70mm (2¾") widths, on 25 metre (approx 27½ yard) reels and in 5m (5½yd) top-up packs. Please click here to see Scottish National Tartan wool plaid tartan ribbon. As always, we are happy to offer FREE worldwide shipping on all orders. 5m (5½yd) top-up packs also available with FREE worldwide shipping, but please note 25m reels are by far the best value.